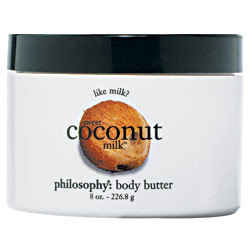 I’ve mentioned before that I adore products that smell like coconut so when Philosophy Sweet Coconut Milk Body Butter hit the Sephora shelves, I had to try it for myself. All I can say is: mmmm, pure yumminess. If you want to try a coconut cream but have had a hard time finding one that isn’t cloyingly sweet, this is the one to pick up. The scent is definitly coconutty, but despite the name it stays very real instead of smelling like a dessert or tanning lotion. As for the body butter itself, it’s thick like most body butters are, but not as greasy. I’d say that this is a great summer body butter – it’s unsticky and absorbs quickly but still rich enough to moisturize.